Arsenal Kyiv are an example of invented traditions, a technique commonly associated with the nation building process of the former Soviet Union’s successor states. But Arsenal Kyiv are so much more than that – today the club are synonymous with all the facets that are now so prevalent in Ukrainian football beyond the mighty few such as Shakhtar Donetsk and Dinamo Kyiv. Arsenal Kyiv share the name of a club who are known around the world, and, in 1925, just like their London namesake, it was the workers from the local arms manufacturer who founded the football club. 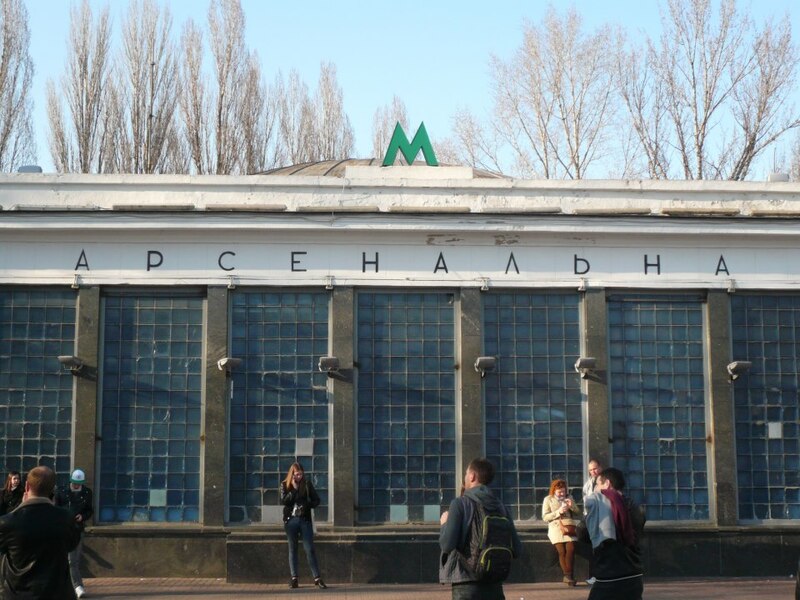 Moreover, Arsenal FC, in another parallel, are the only London-based club that have an underground station named after the club; the same, indeed, is true of Arsenal Kyiv, who have the Arsenal Metro station in Kyiv (the deepest underground station in the world). This is, however, where the parallels come to an abrupt end. Arsenal FC are today one of the richest clubs in the world, who play in an Emirates-sponsored stadium and compete habitually in the Champions League. Regarding modern day Arsenal Kyiv, their homepage claims historical links to the original Arsenal Kyiv football club, who played their home games not far from the Kyiv Arsenal Factory in the Pechersk district of the city. The Kyiv Arsenal Zavod was an arms factory that had been in existence since 1764, originally part of the Kyiv fortress. It is in Pechersk that the workers of the arsenal founded their very own football club in 1925. The original Arsenal football club would become an important historical cornerstone of the new Arsenal Kyiv football club, who were re-established in 2001. Arsenal Kyiv – an Invented Tradition? Football is a great place for inventing tradition. Even the boundless historian Eric Hobsbawm described football, in a seminal text Invented Traditions, as a tool for nation-building because sport can in general invent common traditions, with the use of the likes of flags, songs, and a history. But even though Arsenal claim a history that stretches back all the way to 1925, which would make them in fact the oldest club in Kyiv (Dinamo were founded in 1927), the club is, in reality, a new creation that came into existence in 2001. The claim to tradition is therefore nothing more than a marketing strategy that is supposed to invent tradition where none exists. Arsenal Kyiv are in many ways a Ukrainian 1899 Hoffenheim, a German club who many fans have dubbed Retortenclub (From German Retortenbaby, which means test-tube baby). TSG Hoffenheim have recently renamed itself 1899 Hoffenheim to imply historical tradition where there exists indeed very little. Officially the club was founded in Kyiv’s district Arsenal in 1925 but today’s Arsenal Kyiv have very little in common with the club, who were founded 87 years ago. Arsenal Kyiv de-facto ceased to exist in the mid-1960s when it was first renamed Temp Kyiv by the authorities, and later replaced by Dinamo-2 Kyiv, who were in essence a feeder club of Dinamo that played in the Soviet Second Division (Third Level in the pyramid). Arsenal were therefore fused with Dinamo Kyiv and ceased to exist. The historical connection between the current Arsenal Kyiv club and the former Arsenal workers team is therefore a matter of great dispute. There is also a claim that Arsenal’s heritage belongs to that of the former Army club CSKA Kyiv, who were founded in 1935 and owned by the Ukrainian Ministry of Defence up until 2000. CSKA Kyiv was a typical mid-table club in Ukrainian football, managing to appear in the Ukrainian Cup final twice in 1998 and 2001 where they lost to their city rivals Dinamo and Shakhtar Donetsk, respectively. It was after the 2001 Cup Final that CSKA Kyiv began to experience financial problems. With economic crisis ravaging Ukraine the Ministry of Defence was forced to make financial cuts across the board – high performance football was no longer deemed a priority. CSKA faced extinction but instead the city government, under the leadership of Oleksandr Omelchenko, purchased the club. CSKA-2, who competed in the First Division, became the Army’s new number one club and the restructured CSKA side, who played in the Ukrainian Premier League, were renamed Arsenal. In Kyiv, Dinamo overshadow everything; they are the pride of the city, a club who to this day hold the record number of championships in Ukraine’s Premier League, and most league titles from the Soviet Top League, two European Cup Winners’ Cups, and who were coached by one of the most innovative coaches the world has seen, Valerii Lobanovskii, whose statue now dominates the entrance of the Dinamo Stadium. 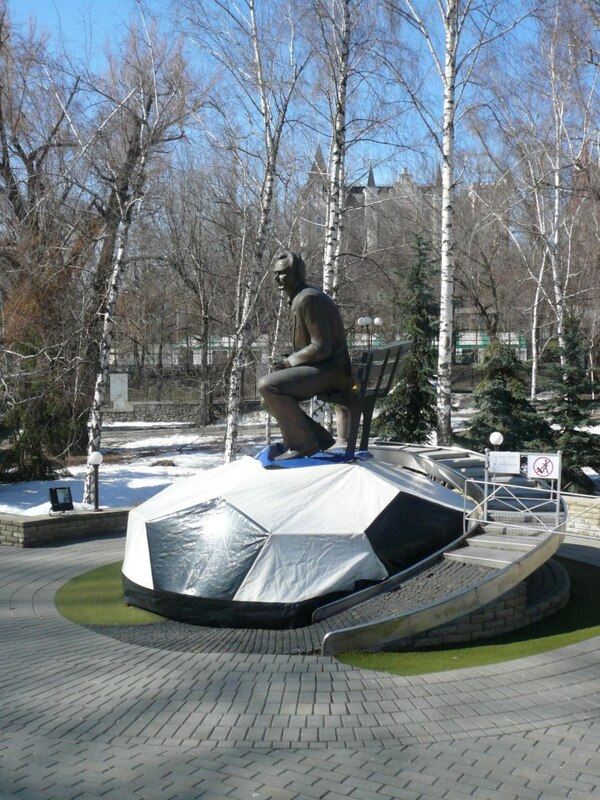 This statue is emblematic of Dinamo’s importance to the city of Kyiv. They are the super club of Kyiv and have earned their special status through sweat and triumph. On the other hand, Kyiv is a city of three million people, a city of such size in which you would expect to find a second, or alternative, club. Arsenal have no Lobanovskii, no statue at the entrance of their stadium – or even if they had, Arsenal have no stadium for such effigies. But, football, unlike other sports, craves tradition thus there appeared a need for Arsenal Kyiv to doctor some genealogical link to Kyivan football regarding the time in which the club was born. 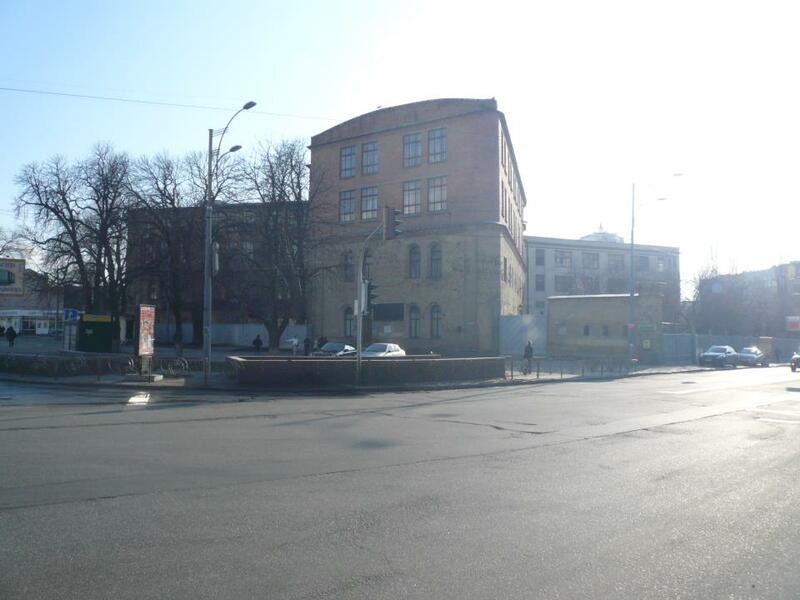 This is why the link to the old and now vacant Arsenal Zavod is so important – the murals and statues around the factory provides the club with its very own Lobanovskii. Last Saturday I made my journey from the old Arsenal zavod (factory) located directly across from the Arsenalna Metro Station. 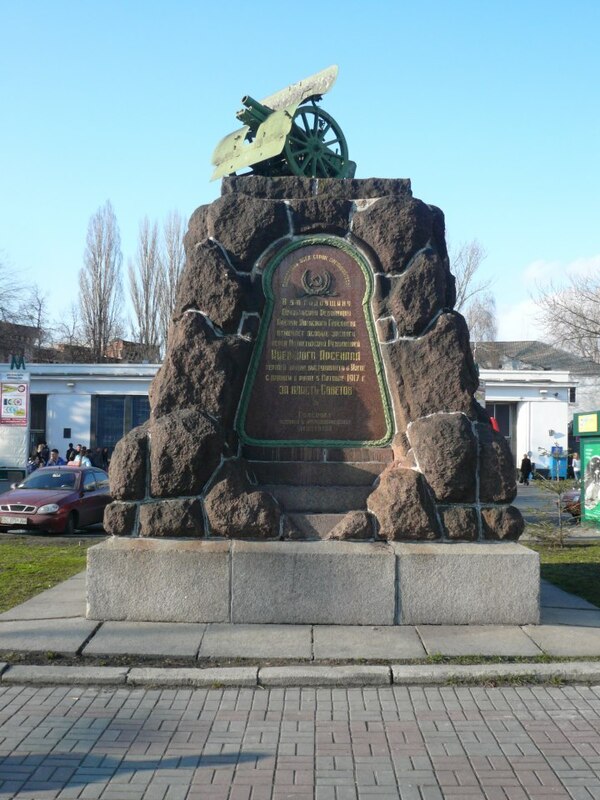 There is a large monument that displays a cannon with an inscription dedicated to the workers of the arsenal. The arsenal itself is designed as a simple brick building, very typical for factories at that time of industrialization. There are, however, several murals cast in steel at the front for the workers that fought for the Bolshevik revolution. From the factory I walk into Mariinskii park and towards the Dinamo Stadium, which is located within the historical park – part of the Imperial Mariinskii Palace that was constructed by Tsarina Elizaveta Petrovna in 1744. As I neared the stadium I could see the old Soviet style floodlights, which provoked a memory from my childhood in Munich when I visited games in the old Gruenwalder Strasse or in the Olympiastadion – in those days Stadium floodlights were like lamps that attracted fans to the game like moths to light. Tickets were cheap, as they are almost always are in Ukraine, and I paid my 30 Hryvna (€3) for centre field tickets. When I take my first glance at the old Dinamo Stadium I right away notice the light blue colours of Dinamo. In fact the stadium still very much looks like Dinamo, which moved to the newly renovated NSC Olimpiyskiy after the 2012 European Championships, were still its tenants. 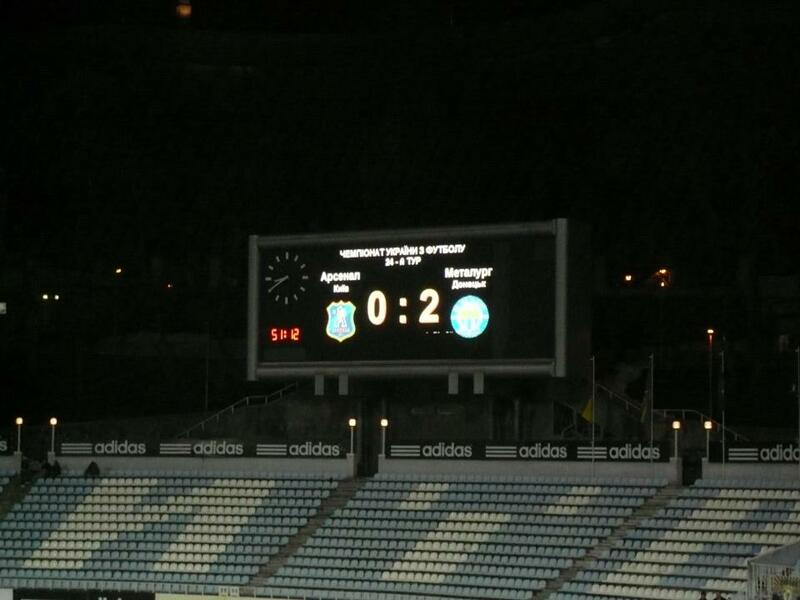 In fact the youth teams of Dinamo as well as their farm team Dinamo-2, which plays in the Ukrainian First League (second division), still use the stadium. Even the advertisements are targeting Dinamo fans – Nike manufacture the Arsenal kits but there are plenty of Adidas signs around the stadium. Also many people at the match are wearing Dinamo apparel and I see many youngsters who clearly represent Dinamo Kyiv at youth level. Just minutes before kick off the windows of the VIP seats just to my rear are lowered, which reveals a row of stern looking dignitaries. Rabinovich is in the stand alongside a jumpy looking man decked out in Metallurg colours, another oligarch by the name of Sergei Taruta and the owner of Metallurg Donetsk. The story of the match is quickly told as Metallurg dominate the match and stroll to a 2-0 victory. Arsenal look out of place in the Ukrainian Premier League – how were they able to beat Shakhtar Donetsk in November? Arsenal are a club without a home, which draws an unfortunate comparison. In a 2012 Unreported World documentary, UNICEF estimated that there may be as many as 100,000 street children in Ukraine. After the restructuring of CSKA to Arsenal the club would play its home games in the massive NSK Olimpiiskii stadium often in front of a crowd of a few hundred followers. Most of whom were pensioners and unemployed workers – a catchment that can so often be found at training sessions of German Bundesliga sides. Later the club would also play in Boryspol, the town in which one of Kyiv’s airport is located –a hike for everyone without a car from the centre. The club would even use the training facilities of the Ukrainian national team, which has a stand with a capacity for 1000 people. But, of course, like every club in the Ukrainian Premier League, an oligarch – who made his money in the early 1990s exporting furniture and natural gas – owns Arsenal Kyiv. It was around that time that Vadim Rabinovich who was convicted of various crimes, fled to Israel, and as a Jew received automatic Israeli citizenship. As a result the Ukrainian government stripped him of his Ukrainian passport and citizenship. The United States also revoked his visa in 1995 because of his connection with the international arms trade and, as the Kyiv Post reported, alleged connections with a Swiss company that was dealing in parts of nuclear missiles. Simon Kuper writes in his book Football against the Enemy that dealings in nuclear missile parts were actually quite common in Ukraine in the early 1990s. Dinamo Kyiv, for example, held a government licence to trade in gold and nuclear missile parts. In 1996 all charges against Rabinovich were dropped and his Ukrainian passport restored – conveniently, that also meant he was a dual citizen in a country where dual citizenship is normally illegal. According to various sources, Arsenal Kyiv are an important centrepiece of Rabinovich’s business empire. The financing of Arsenal allows Rabinovich to use the club as a conduit for money laundering as well as a way to pay fewer taxes, as philanthropic activities in Ukraine are always tax deductible. Rabinovich has been in close cooperation with the city administration to keep Arsenal Kyiv alive. The reason for that is simple; after the departure of Dinamo Kyiv from the Dinamo Stadium the city needed an occupant for the Lobanovskii Stadium, and Arsenal were happy to use the facilities. As the Kyiv Post reported, Rabinovich also has close business ties with the Surkis brothers who operate and own Dinamo Kyiv with both clubs seemingly benefitting from the fact that Arsenal are now playing in Dinamo’s stadium. Like many of the country’s oligarchs Rabinovich is heavily tied into the politics of Ukraine. He is also an active participant in the Jewish community and owns several news stations around the country. On March 4, 2013 a bomb exploded close to his television station Jewish News One. As the Kyiv Post reported, no one was hurt, in what appeared to be a murder attempt on Rabinovich’s life. 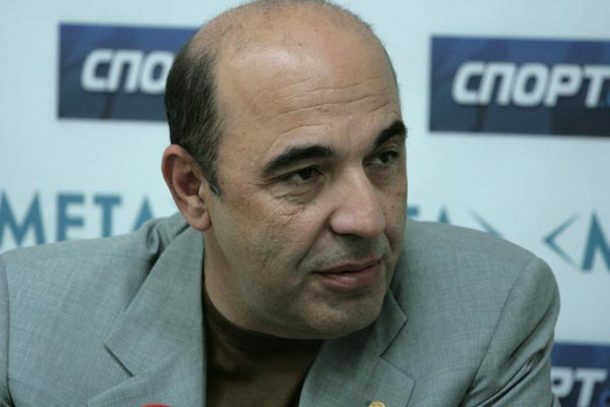 Rabinovich right away claimed that the attempt was made by the all-Ukrainian Union Sovoboda party (more on Svoboda and links with Ukrainian football, click here). But Svoboda of course denied any ties to the bombing. Arsenal are a homeless club, artificially kept on life support by an oligarch who up to this day has not made investments into the club’s facilities; a homeless team in a city of homeless kids. Arsenal, like those children, have been neglected by the city authorities, and are a symbol of Ukrainian society, where there is almost no middle-class. In football terms, Dinamo Kyiv rule supreme in Ukraine’s capital whilst Arsenal, despite its very own oligarch, belong to the second category – the poor. This is true for the entire Ukrainian Premier League, especially teams that are now playing in the new football palaces constructed for the preparation of EURO 2012 who have huge financial advantages over smaller clubs, those of which have to play in shanty stadiums, likely to be deemed unacceptable for professional football in countries like England or Germany. The Ukrainian Premier League has therefore become a competition of many Lilliputs and few Gullivers; a competition in which the poor from the shanty towns are sometimes allowed to beat the kings and queens of the new glass palaces. However, it would be perfect if you mentioned the influence of Kolomoysky’s sponsorship in the recent years, its effect on the recent crisis in the club and the ongoing change of ownership process in the club, which has become a very long story because of Rabinovich’s unwillingness to cover his debts. I want this team managers contact because I have some players from african who want to for the team. Thanks and best of regards. Good article, but I’m not quite sure the comparison with homeless children works: whose situation must be a lot worse that that of the staff of a football club. I don’t think it can be said that the two have neglected by the city’s authorities in quite the same way.